The December 2010 edition of the Association's Journal 40/10 has been distributed to all subscribing members. Due to the adverse weather conditions in December 2010 the Association is aware that the Royal Mail were unable to collect and distribute mail in a timely manner and that many Airports were closed or experienced severe disruption. The Association's expectation is that members residing outside the United Kingdom may experience some delay in receiving their copy of the December 2010 edition of The 40/10. Members residing outside the UK may download a printable copy of The 40/10 whilst waiting for their own personal copy to arrive through the postal mail. This offer is only available to those members who have paid their 2010 subscription. To receive instructions on how to access the December 2010 online edition please use the form providing your name, email address and membership number. If you do not know your membership number please provide the first line of your postal mail address. You will then receive an email from the Association that will include the instructions to access The 40/10. To obtain your personal instructions please click the button and complete and send the form. 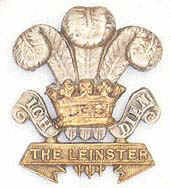 The Regimental Colours of the Leinster Regiment.